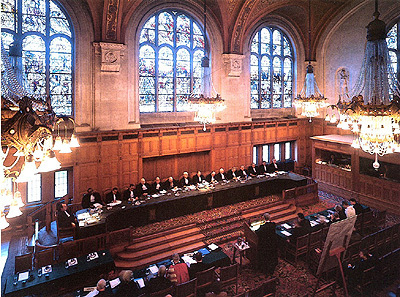 The International Court of Justice in Session The courtroom of the International Court of Justice in The Hague, the Netherlands. The building is colloquially referred to, especially by the Dutch, as the 'Peace Palace'. Justice Michael Kirby is a dissenter in the High Court. On more occasions than any other of the recent High Court Judges, Kirby has dissented in many cases under his Judgment. Nevertheless, he is a popular judge, someone who is well-liked, and not without reason: most of the time his dissent centres around concerns for the universality of human rights, and his desire to grant more, a greater deal of, or a better measure of quality of justice to the appellant. Below is one of his many speeches as part of the ongoing Australian debate on constitutional matters and the law, in this case delivered as the 2004 Robin Cooke Lecture in Wellington, New Zealand. 7 April 2005: Justice Michael Kirby, International law: the impact on national constitutions - Drawing upon sources found in international law as contextual principles, judges of municipal courts in this century will assume an important function in making the principles of international law a reality throughout the world. Robin Cooke, whom I should more reverentially call Baron Cooke of Thorndon of Wellington, New Zealand and of Cambridge in the County of Cambridgeshire , is a kindred spirit. Recently a critic in Australia, meaning to abuse me, likened my "present day absurd perspectives" on industrial law to those of Henry Bournes Higgins, one of the founders of the Australian Commonwealth . Little did he know that I could not have been more flattered. The only greater accolade would have been to liken my perspectives of law to those of Robin Cooke. "... the number, quality and impact of his judgments. These judgments were repeatedly cited in court, and proved of great benefit to judges, the legal profession and teachers of law. Although it was inevitable that a judge such as this would have attracted controversy and criticism, he was rightly hailed as one of New Zealand's intellectual giants, and arguably New Zealand's greatest judge". If I ask myself why I gravitate in the same orbit as Lord Cooke there are several answers. We share the same profound admiration and love of the creative capacity of the English common law, which is the great inheritance of our two antipodean nations. We share a deep respect for British constitutional principles. I suspect that, in our deepest bedrock, such as our attitude to the Crown, we share an essential conservatism that is puzzling to our critics. We would both lament the appalling lack of vision on the part of judges and politicians in Britain at the times after our respective births, and the way this killed off the chance of creating in the Privy Council a true Commonwealth court for the British dominions. Although Lord Cooke participated as a judge in that distinguished imperial court, and indeed in the House of Lords, where he adjudicated nearly a hundred cases , the experiment came too late. It was, in part, the strength of the New Zealand Court of Appeal in the Cooke era that laid the foundation for the final severance of New Zealand appeals to the Privy Council and the creation of the new Supreme Court of New Zealand . I suspect that, as in my own case, when he looks back on his life, Robin Cooke's happiest years will have been in the busy days when he was President of the Court of Appeal. The sheer volume of work and the variety, and often the urgency of, the cases necessitated a collegial spirit that seems to elude apex courts around the world. In his case, as in mine, the Court of Appeal was virtually final. Few cases indeed went on further appeal. There were routine and easy days; but also days faced with the greatest intellectual challenge. These were to golden years in our judicial lives. They were the years in which we first struck up a friendship. In that friendship, I have discovered many intellectual and emotional commonalities. Both of us have sought to intensify the judicial engagement with the academic community. Professor Michael Taggart recently quoted Dame Leonie Kramer as observing that Australia was the "only country in the world where the word 'academic' is regularly used as a term of abuse" . But Taggart declared that this was wrong. Despite New Zealand's astonishing resistance to the blandishments of federal links with Australia, it shares a common suspicion of new ideas and "tall poppies". The law, and even the judiciary, are not exempt from this attitude. Robin Cooke has shown how one can rise above it and continue a judicial commitment to the betterment of society. In the matter of fundamental human rights, Robin Cooke is unashamedly an internationalist and a liberal. I shared with him participation in the series of conferences that were convened by the Commonwealth Secretariat to formulate and refine the Bangalore Principles on the Domestic Application of International Human Rights Norms . This was an idea in which I had been involved from the start . Later I was to be encouraged by Robin Cooke's example  in invoking international human rights law for the development of the Australian common law and the interpretation of ambiguous legislation . It was a notion that was eventually to spread to the High Court of Australia . It was to prove of the utmost importance in a decision of that Court, before my appointment, in a case concerned with a neglected area of the law where President Cooke had showed such leadership in New Zealand . I refer to Mabo , and in particular to the passage in the reasons of Justice Brennan explaining how it was inevitable that the powerful influence of the international law of human rights would come to bear on the exposition of municipal common law. This debate is ongoing, as I shall show. But Robin Cooke was there at the creation. We were both elected members of the International Commission of Jurists, a world-wide body of lawyers devoted to the protection of the rule of law and universal human rights. It was therefore unsurprising to me to witness his "blend of humanity and intellect" in the series of Privy Council cases in the 1990s concerned with appeals by Caribbean prisoners against their sentences of death . Judges who know more about international human rights law tend to be more interested in this growing field of legal doctrine. Lord Cooke's majority and dissenting opinions, with their numerous references to basic rights and to the decisions of the European Court of Human Rights , herald a new time when this source will be an unremarkable font of legal principle. I cannot fail to mention Annette Cooke. For her endurance of so many legal functions alone, she deserves the George Cross. Although in some ways endearingly old-fashioned, Robin and Annette have kept pace with social change and contemporary understandings. They have given the warmest welcome to my partner, Johan. I was proud that Lord Cooke attended the ceremony in Canberra in 1996 when I was sworn into office in the High Court of Australia. Ever since that day I have kept before me his example of professionalism, hard work and courage. There is no point in having a named lecture which makes no reference to the hero whose work is remembered. I am glad to have this opportunity to express once again my alignment with Robin Cooke, a "bold spirit" of the law . You can imagine, therefore, my anxiety when I was asked to return in this lecture to the one major point of intellectual difference that has separated us in the past. I refer to Lord Cooke's theory of common law rights that "lie so deep" that even Parliament cannot override them . My mentor regards me as quaintly unreconstructed and excessively cautious in this regard. Our differing perspectives on this topic probably derive from the different constitutional settings in which we respectively grew up. I propose to revisit this old debate; to sketch the ways in which the High Court of Australia, during the year past, has grappled with cases, arguably concerned with "deep lying rights"; and then to say something about the relevance of the debate to the contemporary New Zealand scene, with the creation of a new Supreme Court. My conclusion will be that the fundamental perspectives of Lord Cooke are not inimical to my basic notion about the law. How our perspectives can be reconciled, and especially in these more conservative judicial times, is a different matter. The search for the Grundnorm: In his essay marking the enactment of the Supreme Court Act 2003 (NZ), Richard Cornes gives a cautious welcome to the new Court, noting what he describes as its creation "at a time of some uncertainty about what sort of nation New Zealand can and should be" . He cites Attorney-General Margaret Wilson's description of New Zealand's "continuing conversation as to the best way by which we should govern ourselves" and the potential of the Supreme Court to become an important new voice in that constitutional conversation . There is no doubt that this prediction of the Attorney-General will come true. Indeed, the constitutional conversation began long ago. It took on a new significance and urgency during President Cooke's time in the Court of Appeal. But if a second-level court of appeal is to have real value, that court must involve something more than reviewing the outcomes of individual cases for a second time. The chief value added is that such a court must clarify, conceptualise and re-state important legal principles and expound the fundamental rules of a nation and "the values [held] in common or which ... the community as a whole [believes it] should hold in common" . It was in this regard that, Sir Robin Cooke, as President of the New Zealand Court of Appeal, puzzled in many important cases about the ultimate foundation, or Grundnorm, of the New Zealand obedience to the law. This was a puzzle, natural enough to a New Zealander, in the post-modern era, once the Grundnorm of imperial authority no longer served adequately as the basis for legality in a sophisticated and modern community such as New Zealand. So what was the legal bedrock? Do New Zealanders obey statutes just because Parliament, elected from the people, enacts them? Or is this obedience grounded in the fact that the judges hold that such enactments are part of the law, as construed by the judges themselves in conformity with rules of the common law designed to uphold basic rights? In a country such as Australia, at least in respect of the federal government (the States are quite another thing ), problems of this kind rarely surface. Formerly, we too accepted the binding force of our federal Constitution because it was enacted as an annex to an imperial statute signed into law in 1900 by Queen Victoria . However in more recent times Australians have searched for a better explanation of their obedience to this sparse document. Today only a dwindling band of traditionalists points to the imperial lineage . Most lawyers - and virtually all political scientists - regard the ultimate foundation for the binding force of the Australian federal Constitution as the consideration of that document by the Australian people in successive referenda in the 1890s, the fact that it was approved by the electors authorised to vote at that time, and its acceptance thereafter by the people of Australia as the basic law for their governance . There are various historical and political flaws with this Australian theory about the modern Grundnorm. However for the most part it works. Every now and again there is a chink in the armour. The most visible one in recent times was the enactment by the United Kingdom Parliament of its counterpart version of the Australia Act 1986 (UK). That Act, and its federal and State counterparts, purported to provide for certain residual constitutional changes for Australia, notably in relation to the States and the termination of Privy Council appeals from State courts . Such a post-imperial intrusion of the United Kingdom Parliament into the constitutional arrangements of Australia can only really be explained by the anxiety of bureaucrats, raised in the imperial era, to engage the mother of parliaments for one last time so as to close any remaining doors of doubt over purely autochthonous legislation. In my view, certainly by 1986, the United Kingdom Parliament had no business whatever (however politely requested and well intentioned in the performance) to be enacting any law concerning Australia's Constitution. The amendment of that Constitution belongs to the sovereign people of Australia as electors in accordance with the federal Constitution  and to them alone . I cite this exotic Australian illustration to show how difficult constitutional law becomes when we move away from the safe harbour of settled constitutional statutes and unquestioned constitutional principles. Most judicial seafarers prefer to stay in that harbour and never to puzzle about what lies outside its calm waters. If ever they venture forth, they go only the shortest possible distance, hugging the coast until they scurry back to the bay of unquestioned rules. It is a mark of his intrepid attitude to law and his intellectual curiosity that President Cooke ventured forth in a series of decisions to explore the extent to which, in the New Zealand constitutional context, courts might, in the case of truly extreme legislation, hold that an apparent parliamentary law is not a law at all, because in breach of fundamental common law rights. The notion that this might be so was not a wholly modern invention. In a number of old cases, decided in England mostly in the 17th century, distinguished judges had rejected as erroneous the notion of parliamentary omnipotence in lawmaking . Their statements, in the century before the foundation of the American Republic, together with the contemporary power of the Privy Council to strike down colonial laws when incompatible with those made by the British Parliament, undoubtedly laid the foundation for the doctrine expressed in Marbury v Madison . That was the decision in which Chief Justice Marshall and the new Supreme Court of the United States asserted the power of that Court to invalidate a law made by the Congress which the Court held to be in conflict with the Constitution. To members of the Congress at the time, and to the President, this was an over-mighty claim. The critics had generally been raised in the notions of the powers of the British Parliament. Yet it was not really until the writings of Professor A V Dicey in the 19th century that the powers of "uncontrolled" parliaments came to be described as "sovereign" . Such was the impact of Dicey's legal analysis and his highly formal notions about "parliamentary sovereignty" during the nascent years of the Australasian settlements that few ever suggested that judges (outside the authority of a written constitutional text) had a power to override a parliamentary enactment. Few, that is, until Justice Cooke began to do so in New Zealand. The New Zealand cases: The first stirrings occurred in 1979. In L v M , a case concerning an ouster clause, defensive of the Accident Compensation Commission, Justice Cooke questioned whether a body that was not a court could conclusively determine whether proceedings in a court were barred under a statutory provision seeming to permit that course. Under the federal Constitution in Australia, in federal matters, only a court could so decide conclusively . Justice Cooke suggested that there was "room for doubt" whether the New Zealand Parliament could "constitutionally do so" . There followed a number of cases where similar points arose in instances where the courts were pushed to the brink by seemingly extreme legislation. Brink there undoubtedly was, Justice Cooke pointed out, because were Parliament to abdicate its function such an enactment could not be a valid law . There were limits. And ultimately it was for the judiciary to decide where those limits lay . "This is perhaps a reminder that it is arguable that some common law rights may go so deep that even Parliament cannot be accepted by the Courts to have destroyed them". "I do not think that literal compulsion, by torture for instance, would be within the lawful powers of Parliament. Some common law rights presumably lie so deep that even Parliament could not override them". I will not repeat the other cases, and the decisions of other judges, in New Zealand that have explored this basal question . Nor will I return to my own remarks in the New South Wales Court of Appeal soon after these cases were decided. There a party, protesting at the termination of its proceedings by State legislation, unsuccessfully invoked the reasoning of Justice Cooke and the theory of "deep" rights that a so-called "sovereign" Parliament could not override . In Australia many of the problems that Justice Cooke was confronting in the special circumstances of New Zealand did not arise for judicial consideration. In part, this was because of the usual prudence of democratically elected legislatures and their avoidance of "extreme" measures. But it was also because of the ready availability of the interpretative principle requiring that interference by Parliament with basic rights must be made absolutely clear . There was as well the ever present usefulness of the common law to fill perceived gaps in legislation . Moreover, there remained in Australia the brooding omnipresence of the written constitution, with its independent federal judicature and its protections expanded in recent times to defend State as well as federal courts from the imposition of functions incompatible with the exercise of the federal judicial power . Nevertheless, here was a serious difference between Justice Cooke and myself. He suggested that in some cases where legislation was formally valid, it might nonetheless remain for the courts in extreme cases not to give it effect. I suggested that in Australia this could not be so. Ironically it was the very power under the Australian Constitution (not infrequently exercised) to strike down laws as constitutionally invalid, federal and State , that makes Australian judges somewhat cautious about talk of a still larger claim to the power of invalidation, sourced in the common law. Perhaps it is the absence in New Zealand of any formal constitutional power to invalidate a national law, found by judges to exceed the permissible constitutional boundaries, that encourages the New Zealand judicial mind to explore a common law constitutional principle to defend the law and the citizens from a truly extreme enactment purporting to override "rights that lie so deep". "Scrupulously not committing himself to such a volte-face, he nevertheless quietly opens the door to it". So how fares this debate in the Australian courts today? Has the hoped for volte-face occurred? Or have Australian judges and lawyers remained incorrigibly resistant to Lord Cooke's "deep rights" theory? That is the subject of this lecture. It will take me, I hope without parochialism, into some recent decisions of my Court. A case of unjust acquisition: As it happens, in the past three years a number of cases have come before the High Court of Australia challenging both State and federal legislation in a way that arguably presented the issue of the validity of laws offensive to "deep" or "fundamental" rights recognised by the common law. The first case was Durham Holdings Pty Ltd v The State of New South Wales , a decision of 2001. The case concerned the validity of the Coal Acquisition Act 1981 (NSW). That Act had been passed by the New South Wales Parliament. In every formal way, it conformed to the State Constitution, a law which derives from colonial times and is continued in operation by force of the federal Constitution . By virtue of the Act, coal in defined lands in New South Wales was acquired and vested in the State Crown . Under the Act, it was for the Governor to make arrangement for the payment of compensation to land owners who thereby lost a valuable right to property. The Act permitted arrangements that would differentiate between persons to whom compensation was payable. It provided that specified persons were not entitled to be paid the identified amount. One clause of the arrangements made by the Governor (on the advice of the Executive Government of the State) provided that compensation for the acquisition of coal, payable to an identified company, must not exceed a specific amount . That company challenged the clause so providing. It alleged first that it was a subordinate law beyond the power conferred by the Act. That challenge, of a fairly orthodox variety, was unanimously dismissed. A bolder second claim made by the company was that the State Parliament had no legislative power to deprive the company of its property without just compensation. In supporting that argument, counsel for the company relied on predictable suggestions to the effect that the legislation failed to indicate a sufficiently clear intention to deprive the company of property without just compensation. However the legislation and the arrangements were perfectly clear. They were reinforced by a ministerial speech in the State Parliament. This challenge was likewise unanimously rejected. The company was therefore forced back on a third challenge. This asserted that the New South Wales Parliament lacked the legislative power to acquire property without just compensation. This argument contended that Dicey's theory of parliamentary "sovereignty" was unhistorical and an unfounded over-simplification . It asserted that it was for the courts to define the powers of the legislature. It argued that uncompensated appropriation was so incompatible with basic common law principles that the State Parliament, from its first foundation as a subordinate colonial legislature, lacked a power to so enact. This argument was also unanimously rejected. Four members of the High Court , in short reasons, saw this third challenge as foreclosed by decisional authority upholding the proposition that the State Parliaments in Australia enjoy all the legislative powers that the Westminster Parliament possessed, subject only to the Australian federal Constitution . In those decisions the High Court had declared that it need not explore the question whether the exercise of such legislative power was "subject to some restraints by reference to rights deeply rooted in our democratic system of government and the common law" . The power of such a Parliament to deprive persons of property without just compensation was held not to be such a "deeply rooted" right, assuming that to be an exception to a legislature's powers. In my separate reasons I came to the same conclusion. But I took some pains to respond to the arguments of the company which in its third submission had relied heavily on Justice Cooke's remarks in the New Zealand series of cases. The facts, when explained, showed (arguably) how unjust and discriminatory the acquisition law in question was. However a particular textual difficulty for the appellant's third argument was that, whereas in the federal Constitution specific provision is made requiring the provision of "just terms" for government acquisitions , no such provision exists in the State constitutions, including the Constitution Act of New South Wales. Moreover, an attempt by referendum in 1988 to insert such a provision in the federal Constitution, protective against inadequately compensated State acquisitions, failed . In the close of my reasons in Durham Holdings, I referred to the way in which Australian judges may respond to "extreme laws". Thus they may apply the strict rule of interpretation, protective of basic civil rights. They may sometimes be entitled to invoke the federal Constitution against the impugned State laws . Occasionally international law may assist in suggesting a favourable construction of an ambiguous provision . In certain truly extreme cases, it might be arguable that a purported enactment was not a "law" of the kind envisaged by the Australian Constitution . Such an approach might follow from the recognition of the fact that the foundation of Australia's Constitution lies in the will of the Australian people . Nevertheless, you will observe the unremarkable fact that in the Durham Holdings case all of the judges of the High Court of Australia traced their analysis, one way or the other, back to the federal constitutional compact. This is a consequence of living for a century under that law and accepting it as the basic law of the nation. Federalism is constitutionalism. It cultivates and constantly reinforces that habit of mind. A case of children's migration detention: A second case arose in the High Court of Australia in 2004 concerning the validity of a federal law providing for the compulsory detention of children in immigration custody . The children (and their parents), all unlawful non-citizens who had arrived in Australia claiming to be refugees, were held in a migration facility in a remote part of the country. After extended detention, the children were released by order of the Family Court of Australia. This order was made on the basis that their continuing detention was harmful to the children's interests and welfare, a matter which the Family Court found was within its jurisdiction and powers under the Family Law Act 1975 (Cth). There was thus a suggested intersection of that Act with the Migration Act 1958 (Cth). For varying reasons, the High Court of Australia unanimously upheld the Minister's appeal against the Family Court order. The order was set aside. All members of the High Court concluded that the Family Court lacked the jurisdiction and powers to order the Minister to release the children held under the applicable provisions of the Migration Act. In my reasons, the issue came down to the reconciliation of the general provisions in the Family Law Act (respecting child welfare) and the highly specific, clear, constitutionally valid and plainly intentional provisions of the Migration Act (obliging detention of all such illegal immigrants, including children). In such a clash the specific overcame the general. The general could not apply. A very strong case was mounted on behalf of the children to show that their detention was contrary to Australia's obligations under international law, specifically under Article 37 of the United Nations Convention on the Rights of the Child . That article states "the detention ... of a child ... shall be ... used only as a measure of last resort and for the shortest appropriate period of time". Under the Migration Act, in the cases to which it applied, detention was a first and mandatory resort and it applied to children sometimes for very long periods of time. Nevertheless, the evidence in the case showed that this (and other) possible departures from international law had been drawn to the specific attention of the Federal Parliament in three parliamentary inquiries which had taken place. None of these inquiries had resulted in an alteration of the mandatory detention requirements of the Migration Act. "... Those sections [of the Migration Act] are constitutionally valid. In the face of such clear provisions, the requirements of international law ... cannot be given effect by a Court such as this. This Court can note and call attention to the issue. However, it cannot invoke international law to override clear and valid provisions of Australian national law. The Court owes its duty to the Constitution under which it is established. Pursuant to the Constitution, all laws made by the Parliament of the Commonwealth are 'binding on the courts, judges and people of every State and every part of the Commonwealth' . Those laws must be obeyed and enforced, whenever they are valid and their obligations are clear and applicable. They cannot be ignored or over-ridden, least of all by this Court". "For an Australian court, a refusal to apply, and to give effect to, provisions of a valid federal Act is not an available option. Fundamental to the Australian Constitution is respect for the rule of law. If the law is clear and constitutionally valid, it is the duty of Australian courts to apply its terms. This is so whatever judges or others may think about the content and effect of the law. Under our constitutional arrangements, changes to the content of such laws normally depend upon the political process, particularly the regular election of representatives to legislatures of Australia: federal, State and Territory". Because under the Australian Constitution the Federal Parliament has powers to make laws with respect to "aliens" and "immigration", the validity of the statutory requirement of detention was unquestionable. Clearly, detention was one way of dealing with aliens crossing the national border. The only way of attacking the law, which was tried unsuccessfully in the second case, was to suggest that such long-term detention amounted to a form of punishment, a course of action that could not be implemented by Parliament or the Executive but only by the judiciary following proof of some offence. In my view, in the second case, that line of reasoning failed for want of evidence . However, as I will show, such an argument was advanced in another case. Indeed, it was almost successful in that instance. Other cases: Retreat from Fundamental Rights? Further cases, decided in Australia in 2004, may be mentioned to show the current approach of the High Court of Australia to "deep" or "fundamental" rights lying outside the Australian constitutional text. They are, I will suggest, discouraging to the notion that the law, and the judiciary, will hasten to the assistance of people where their "deep" or "fundamental" rights are denied. Although sometimes judicial relief is given, it is a comparatively rare event. Far from embracing Lord Cooke's concept about inalienable fundamental or "deep" rights, the trend of decisions in Australia at least must now been seen as generally unhelpful to such protection. This is so whether by way of elaboration of the constitutional text or by invoking the doctrines of the common law. A starting point to make this observation good is the decision in Attorney-General (WA) v Marquet . Although decided in 2003, this case was reported early in 2004. It concerned the franchise in the State of Western Australia and the attempts of the government of that State to pilot through the State Parliament a legislative provision removing, by ordinary law, an "entrenched" law providing for significantly unequal distribution of electors as between metropolitan and rural electorates. All members of the High Court of Australia, other than me, found it simple to uphold the entrenchment and to reject the amendments designed to permit the adoption of roughly equal electorates as found everywhere else in Australia, both federally and in other States. However, for me the problem was more complicated. This was both for reasons of interpretation and because of my view concerning the power to "entrench" State laws. Part of my dissent rested upon a demonstration that the "malapportionment" of electorates in Western Australia, necessitated by the "entrenched law", went to the heart of the democratic postulate of lawmaking within the State . It was contrary to the principles accepted in the International Covenant on Civil and Political Rights (ICCPR), binding on Australia . Any ambiguity in the State constitutional provisions would, in my view, be construed in favour of respecting such fundamental human rights, not over-riding them . I concluded that the so-called "entrenchment" was ineffective, whether attempted under the Colonial Laws Validity Act 1865 (UK) or the new Australia Acts of 1986. In my view, courts view such attempted "entrenchment" with vigilance because they amount "to an endeavour by ordinary legislation to stamp the will of the past upon the State parliaments and electors of the future" . However my view did not prevail. The entrenchment was upheld. So, accordingly, were the unequal electorates and franchise rights which the entrenchment protected from repeal by an ordinary majority vote in the State Parliament. In February 2004, a majority of the High Court reversed a constitutional decision reached only two years earlier protecting from expulsion from Australia as "aliens" a member of the residual class of non-citizen British subjects who had come to Australia before 1986: Shaw v Minister for Immigration and Multicultural Affairs . A majority in that case overruled the earlier decision reached but two years earlier . The new majority was assembled after a change in the composition of the Court . During argument the Court was told that more than half a million United Kingdom citizens, most of whom had come to Australia as assisted migrants (and in the case of the litigants as infants), were subject to the asserted power of ministerial expulsion. It was potentially a grim prospect, given precedents of such expulsions in other parts of the world. The power of Ministerial expulsion was upheld by a majority of the Court by reference to the constitutional grant to make laws with respect to "aliens". No "deep lying rights" could spring to the aid of these residual British subjects. More recently, the same power was upheld to permit a child born in Australia to illegal immigrants to be removed as an "alien". The Act of Parliament provides a qualifying period of 10 years' residence before the children of a non-citizen may acquire Australian citizenship by birth . That provision was held to be valid. "Prisoners are human beings. In most cases they are citizens of this country, 'subjects of the Queen' and 'electors' under the Constitution. They should, so far as the law can allow, ordinarily have the same rights as all other persons before this Court. They have lost their liberty while they are in prison. However, so far as I am concerned, they have not lost their human dignity or their right to equality before the law" . There were in my view no "deep lying rights" of the common law to which I could appeal to overcome the opinions of my colleagues concerning the constitutional or statutory applications. However, by reference to the universal principles of human rights  and the assumptions of Australian constitutional and statutory law, I found a legal foundation and explanation for my view. But it did not prevail. In September 2004 came a series of decisions in which fundamental or "deep lying" rights were unquestionably raised. One concerned the entitlement of a migration detainee to plead, in a defence to a criminal charge for "escaping" from detention, the assertion that the conditions in which he had been kept were inhuman, degrading and contrary to the requirements of the ICCPR: Behrooz v Secretary, Department of Immigration, Multicultural and Indigenous Affairs . I considered that the law gave him that entitlement. The majority disagreed. Even more important was the case of Al-Kateb v Godwin . There, a stateless Palestinian who had arrived in Australia without authority and who was denied refugee status, claimed that his detention was unlawful after he was held despite his request under the Migration Act to leave Australia. Attempts by Australia to find a state willing to accept him had failed. He argued for statutory and constitutional reasons that he could not be detained indefinitely. A majority of the High Court of Australia rejected that argument. Chief Justice Gleeson, Justice Gummow and I would have allowed the appeal. I referred to the constitutional principle that, as such, punishment, in federal matters, was exclusively a judicial function. Indefinite detention could, after the passage of sufficient time, convert a law against aliens into a law of punishment . The other dissentients rested their opinions on their interpretation of the Migration Act. "When such a court [as the United States Supreme Court], in a legal culture traditionally less open to outside legal ideas than ours has been, accepts the relevance for its reasoning of the jurisprudence emerging from a 'wider civilisation' , it is time for this Court to do likewise". Justice McHugh would have none of this. He gave detailed reasons why, in his opinion, international law was irrelevant to determining whether the Australian written Constitution afforded any fundamental rights and protections . Justice McHugh acknowledged that many eminent lawyers had suggested the insertion of a Bill of Rights into the Australian Constitution, adopting international human rights law. However, in the absence of such a formal development, it was not competent for judges to draw on international instruments and to read them into the Constitution . At least in Al-Kateb, the intellectual battle is joined. It is reflected by a similar clash of judicial opinions in the Supreme Court of the United States at the same time . We have not heard the end of this argument . It illustrates the way in which differences over "deep" or fundamental rights are resolved, if at all, in the Australian judiciary. In the presence of a written national constitution, the notion of reaching for the common law as a source of inalienable rights is unlikely to succeed against a statutory command, unless a textual footing in the written law can be found. Even the use of international human rights law to illuminate that footing is regarded by some judges as controversial. I pass quickly over the decision in Re Colonel Aird; Ex parte Alpert , a case which enlarged the jurisdiction of military tribunals operating outside the judicature created by Chapter III of the Australian Constitution. That case, in which Justices Callinan, Heydon and I dissented, carries some resonances of the recent cases in the United States Supreme Court relating to Guantanamo Bay  and the detention of alleged terrorists there for trial before military commissions . Some may think this an unsuitable time to enlarge the powers of Australian military tribunals beyond past constitutional prescription, yet that is what occurred. The dissenters in Re Aird would have adhered to the traditional, very limited scope for military tribunals, having regard to the text of the Australian Constitution, past authority and British constitutional history. Nevertheless, the contrary view carried the day. In October 2004 came two decisions of the High Court of Australia concerning the validity of State laws that involved the State judiciary in the effective imposition on already convicted State prisoners of additional detention because of fears about their re-offending if ever released. In one case, Fardon v Attorney General (Q) , a Queensland statute engaged a judge of the State Supreme Court to extend a sentence, fully served, on the basis not of what the prisoner had done but what psychiatrists predicted he would do if released. Predictions of dangerousness are notoriously unsafe . One scholar who had examined the materials suggested that such predictions result in only a one-third to 50 per cent success rate. This means that in the balance of cases liberty is denied unjustly, effectively on a "guess". No established mental disorder had to be proved under the State Act, simply a prediction by psychiatrists. The risk of the extension of such a principle is obvious. In Germany under the Nazis, the law moved from punishing certain prisoners for what they had done to punishing them for a "deep-rooted" inclination towards criminality. This was so-called "phenomenological punishment" . It was my view that it was incompatible with the requirements governing the State judiciary in the integrated judicature of the Australian Commonwealth . However, in the Queensland case, and in Baker v The Queen , a case from New South Wales where legal consequences of effectively permanent detention were attached to earlier non-normative judicial remarks on sentence, the majority of the High Court of Australia saw no invalidity in the law. I regarded such cases as incompatible with the judicial function which (cases of established mental disorder apart) involve detaining people for what they have done, not for what it is expected or predicted they might do in the future. Again, mine were solitary dissents. The majority saw no infraction of the requirements of the judicial chapter of the Australian Constitution. Although once again in these cases I referred to the international law of human rights, no-one suggested that the State Acts were other than "laws". Although they arguably departed from traditional principles of judicial punishment they measured up to all the formal requirements. They were passed by majority in Parliament. They were presented to the State Governor. They received the Royal Assent. On their face they were "laws". The extent to which such laws were a response to tabloid journalism and populist "law and order" campaigns was reflected in the parliamentary debates cited in the judicial reasons . However, it was held that these factors could not affect their legal validity. Inferentially, this was viewed by the majority as a permissible operation of the democratic process. To whom does "Sovereignty" belong? There is much talk in New Zealand , Australia and Britain about "parliamentary sovereignty" . In my opinion, at least in Australia, this phrase is inappropriate to our constitutional arrangements. In fact it is just another instance of a notion of English law, disputed in England, being picked up and repeated in Australia without regard to the different legal situation . In the Australian Commonwealth sovereignty belongs to all of the people who are Australian nationals. They are the "electors" who vote for the legislatures. Their participation is needed, under the Constitution, to change the basic law. In this context, "sovereignty" does not belong to Parliament, whether the Federal Parliament or a State Parliament any more than to the Crown, which is sometimes for historical reasons called the sovereign. Those bodies are instruments, in their own particular spheres, of the people's sovereignty. Necessarily each sphere is limited. Only the people, conceived as a whole, enjoy the entire ultimate governmental power. And today even that assertion must be qualified by reference to international law and global forces . Of course, sovereignty does not belong to the Executive or the Governor-General or Governors, still less to the courts. A democracy and especially a federation such as Australia, is a place of shared powers. It has many checks and balances. Parliament tends to reflect, in a very general way, transient popular majorities. The sad experience of history, including recent history , is that parliaments, from time to time, overlook or even override the fundamental rights of minorities. In Australia, this has been done to those of minority religions , communists , refugees  and others, including a minority I understand well, homosexual people. In such cases, to talk of parliamentary "sovereignty" is not only incorrect; it is positively misleading. It leads parliamentarians to believe that they enjoy a plenary and uncontrolled power. At least under Australia's constitutional arrangements, that is never so. Their powers are always subject to the written Constitution and ultimately determinable by courts of law. Where governments enjoy large majorities in a unicameral parliament, or effective majorities in both houses of a bicameral parliament, the role of the courts in protecting minority rights becomes more important. It is a power to be exercised lawfully, wisely and for the purpose of protecting the true sovereign - all of the people of the polity concerned. At least in a country such as Australia, without a comprehensive and entrenched Bill of Rights, it is natural that courts should scrutinise cases of apparent or arguable injustice against the criterion of whether the written Constitution permits it - either in its text or in the implications derived from that text or the assumptions upon which it is drawn. Sometimes, as in the Communist Party Case of 1951, the answer given in Australia has been a resounding "no". Sometimes, as in the 2004 decisions of the High Court of Australia that I have mentioned, the answer given by a majority is that the Constitution provides no impediment. Looking to the common law for "deep rights" is not in such circumstances likely to be a fruitful exercise. More helpful by far are the text and implications of the written document elaborated (as in my opinion it may be) by reference to the fundamental principles of human rights appearing in international law, including as that law is binding on Australia. In New Zealand, where there is no written constitution, no "entrenched" and superior Bill of Rights, no tradition of judicial invalidation of "unconstitutional" laws, and a general history of temperate lawmaking, the legal environment is very different. It is natural in such an environment that judges, conscious of the importance of fundamental human rights, will speculate about the availability of judicial means to protect the people in truly extreme cases, even against a statute, apparently valid on its face. The "deep lying" rights theory will doubtless continue to evolve in New Zealand. As a nation engaged in a profound conversation about its constitutional future, New Zealand may find its own means of protecting certain laws and conventions against erosion. Perhaps it will elevate some of them to a superior legal status as constitutional norms, such as the rights of the indigenous people guaranteed in the Treaty of Waitangi . In Australia, we will be watching these developments across the Tasman with the fascination of a sibling. The extent of invalidation of legislation under Lord Cooke's "deep lying" rights thesis can hardly be described as bounteous. Nevertheless, the idea has been propounded. And in New Zealand it is basically all that the judges have to deploy against truly extreme laws, other than the democratic and interpretative response that have not always, and elsewhere, proved sufficient or effective. A nation's constitution is like a symphony. Sometimes it is like the sound of a multitude of voices. Normally the sound is acceptably harmonious, at least in countries like Australia and New Zealand. But sometimes there is upsetting colophony that causes pain and distress. In most civilised societies today, by the use of enforceable human rights instruments, reinforced by national, regional and international human rights law, the lawmaking process of the national legislature is supplemented by judicial protections. In this sense, the legislators are not "sovereign", if ever they were. They are subject to the overriding requirements of human rights and fundamental freedoms. In this way, the legislators in Parliament are reminded of their subordination, more than in occasional and sometimes chancy elections, to the basic rights of the true sovereign - the people whom all public officials serve. In Australia, we have a written Constitution that is accepted as enjoying a superior and entrenched status. As Justice McHugh remarked in Al-Kateb, Australia may now need a written Bill of Rights despite the opposition to that notion on the part of those on different sides in politics who cling to the idea of unrestrained legislative power and talk misleadingly of "parliamentary sovereignty". In New Zealand, you have a legislative Bill of Rights. You also have Robin Cooke's theory. As the willingness of the High Court of Australia to find rights implied in the language and structure of the Constitution recedes , it is inevitable that calls for a constitutional bill of rights will resurface and the pressure for its adoption will grow . At least in a federation, with a written constitution, the notion of unchecked legislative power, that can diminish fundamental human rights without hindrance or protection from the courts, is not likely to prevail in the long run, in the antipodes anymore than elsewhere . In the end, both Australia and New Zealand have generally avoided extremes of law. But not always. They have normally repaired serious justices to minorities before such injustices became intolerable. But not always. Both have mobilised the system of representative, electoral democracy to reflect, over time, the will of the electors. Yet events of recent years suggest that our constitutional arrangements may be under greater strain than was previously the case. Divisions may be more acute today than in the past. Attacks on the judiciary may be less careful than once they were . These therefore are times when a vigilant and courageous judiciary is required as an occasional counterpoise to elected parliaments and ministries. That is not a fault or weakness of our constitutional arrangements in Australia and New Zealand. On the contrary, it is part of their genius and a reason for their general success. The protection of fundamental human rights, and especially the rights of minorities, is one of the great issues of the law and of the world today. As the so-called end of history gives way to a clash of civilisations and as extremism and fundamentalism continues to rise in many lands, the harmony of our constitutions must be preserved . The judiciary has an essential role in achieving that end. Judges often travel to the beat of a drum different from that heard by legislators and the executive. Their sights are, or should be, fixed on a different timeframe - one measured in decades or centuries, not responding to populist causes, wedge divisions or tabloid fury. Robin Cooke, the New Zealander, was right, and typically courageous, to identify a problem of our constitutional arrangements when "deep lying rights" are threatened by laws that appear formally valid. He was right to suggest a solution. The problem is undoubted. The solution is one upon which different countries will take different paths or no path at all, according to the temper of the times and their own constitutional traditions. The temper of the present time is, sadly, often angry. In such a time, the calm and resolute voice of the judges, listening to the centuries, upholding fundamentals when they lawfully can, is more needed than ever before. The name assumed by Lord Cooke. See The Times (London), 9 April 1996, 16; cf P Spiller, "A Commonwealth Judge at Work: Lord Cooke in the House of Lords and Privy Council" (2003) 3 Oxford University Commonwealth Law Journal 29. D Moore, "Over Mighty Judges - 100 Years of Holy Grail is Enough", unpublished talk to the HR Nichols Society, XXV Conference, 6 August 2004, 16; cf MD Kirby, "Centenary of Conciliation and Arbitration in Australia", unpublished, Melbourne, 22 October 2004. See RP Meagher, JD Heydon and M Leeming, Meagher, Gummow and Lehane, Equity, Doctrines and Remedies (4th ed, 2002) reviewed and criticised by Justice Peter Young, Bar News (NSW), Summer 2003/4, 71. P Rishworth (ed) The Struggle for Simplicity in the Law: Essays for Lord Cooke of Thorndon (1997). See M Hardie-Boys, ibid, "Introduction", v; and D Williams, "Lord Cooke and Natural Justice", 188; cf S Franks, "Political Criticism of Judges"  NZLJ 11 at 13. Spiller, above n 1, 29. M Taggart, "The New Zealandness of New Zealand public law"  15 Public Law Review 81 at 85; "The Supreme Court"  NZLJ 390. Quoted in A Dillon-Malone, The Cynics' Dictionary (London, 1998), 19. (1988) 14 Commonwealth Law Bulletin 1196; (1988) 62 Australian Law Journal 531. MD Kirby, "The Australian Use of International Human Rights Norms: From Bangalore to Balliol - A View From the Antipodes" (1993) 16 University of New South Wales Law Journal 363.
 eg Tavita v Minister of Immigration  2 NZLR 257 at 266; cf Al-Kateb v Godwin (2004) 78 ALJR 1099 at 1134 . See eg Young v Registrar, Court of Appeal [No 3] (1993) 32 NSWLR 262 (CA). eg Minister for Immigration and Ethnic Affairs v Teoh (1995) 183 CLR 373; cf Vishaka v State of Rajastan, Supreme Court of India, 13 August 1997, 14-15 and Re Minister for Immigration and Multicultural and Indigenous Affairs; Ex parte Lam (2003) 214 CLR 1 at 21 , 48 . New Zealand Maori Council v Attorney-General  1 NZLR 641 (CA). See eg Muriwhenua  2 NZLR 641 (CA); Te Runanga o Te Ika Whenua Inc  2 NZLR 20; Taiaroa v Minister of Justice  1 NZLR 411; cf T Bennion, "Treaty-Making in the Pacific and the Treaty of Waitangi" (2004) 35 Victoria University of Wellington Law Review 165.
 eg Fisher v Minister of Public Safety and Immigration [No 2]  1 AC 434 (PC). eg Reynolds v Times Newspaper Ltd  2 AC 127 at 223 (HL); Darker v Chief Constable of West Midlands  1 AC 435 at 455 (HL). Candler v Crane Christmas and Co  2 KB 164 (CA) at 178 per Denning LJ. MD Kirby, "Lord Cooke and Fundamental Rights" in Rishworth, above n 4, 334. R Cornes, "There's More than One Song Worth Singing: The Supreme Court and the Legal System" (2004) 15 Public Law Review 137 at 145. M Wilson, "Some Observations on the Evolution of New Zealand's Constitution", Vice Chancellor's Lecture, University of the Waikato, 17 March 2004, cited Cornes, above n 19, 145. British American Tobacco v Western Australia (2003) 77 ALJR 1566 at 1592-1594 -. See RR Garran, Prosper the Commonwealth (1958) 99 ["To become law, the Constitution needed to be enacted by the Parliament at Westminster; but first it must be accepted by the parliaments and peoples of the colonies."]. Commonwealth of Australia Constitution Act 1900 (UK), 63 and 64 Vict, c 12. Nationwide News Pty Ltd v Wills (1992) 177 CLR 1 at 69; Australian Capital Television Pty Ltd v The Commonwealth (1992) 177 CLR 106 at 138; McGinty v Western Australia (1996) 186 CLR 140, 230; cf MD Kirby, "Popular Sovereignty and the True Foundation of the Australian Constitution" (1996) 3 Deakin Law Review 129 reproduced in MD Kirby, Through the World's Eye (Federation Press, Sydney, 2000) at 145. Australia Act 1986 (UK and Cth), s 11. Attorney-General (WA) v Marquet (2003) 78 ALJR 105 at 141 ; cf A Twomey, The Constitution of New South Wales (Federation, 2004), 114. Durham Holdings Pty Ltd v New South Wales (2001) 205 CLR 399 at 420  citing Dr Bonham's Case (1610) 8 Co Rep 113b at 118a [77 ER 646 at 652]; (Coke LCJ); Holdsworth, "Sir Matthew Hale on Hobbs: An Unpublished MS" (1921) 37 LQR 274 (Hale LCJ); Pollock, "A Plea for Historical Interpretation" (1923) 39 LQR 163 at 165 (Holt LCJ); R v Inhabitants of the County of Cumberland (1795) 6 TR 194 [101 ER 507] (Kenyon LCJ); Heathfield v Chilton (1767) 4 Burr 2015 at 2016 [98 ER 50 at 50-51] (Lord Mansfield); and Parliamentary History of England (1813) v 16, 168 (Camden LCJ). AV Dicey, Introduction to the Study of the Law of Constitution (10th ed, 1959), 39-40; cf Sue v Hill (1999) 199 CLR 462 at 492  and G Winterton, "The British Grundnorm: Parliamentary Supremacy Re-examined" (1976) 92 LQR 591 at 592. Plaintiff S157/2002 v The Commonwealth (2003) 211 CLR 476 at 494 ; 513 -. 2 NZLR 519 at 527. Brader v Minister of Transport  1 NZLR 73 at 78. New Zealand Drivers' Association v New Zealand Road Carriers  1 NZLR 374 at 390. 1 NZLR 116 at 121 (emphasis added). See also BV Harris, "The Law-Making Power of the Judiciary" in PA Joseph (ed) Essays on the Constitution (1995), 264 at 269-270. 1 NZLR 394 at 398. See also Keenan v Attorney-General  BCL 1505. See MD Kirby in Rishworth (ed) above n 4, 338-339. Building Construction Employees and Builders' Labourers Federation of New South Wales v Minister for Industrial Relations (1986) 7 NSWLR 372 at 405-406. Potter v Minahan (1908) 7 CLR 277 at 304; Coco v The Queen (1994) 179 CLR 427 at 435-436; Wik Peoples v Queensland (1996) 187 CLR 1 at 123-124, 155, 185-186, 247-248; Daniels Corporation International Pty Ltd v ACCC (2002) 77 ALJR 40 at 60 ; cf R v Secretary of State for the Home Department; Ex parte Simms  2 AC 115 at 131; R (Morgan Grenfell and Co Ltd) v Special Commissioner of Income Tax  1 AC 563 at 615 . Carroll v The Queen (2003) 212 CLR 635. Kable v Director of Public Prosecutions (NSW) (1997) 189 CLR 51. In the author's essay in Rishworth, above n 4 at 343, he acknowledged that had the BLF case of 1986 been decided after Kable, the principle in that case would have repaid reconsideration. State laws may suffer this fate: see Ha v New South Wales (1997) 189 CLR 465; Alders International Pty Ltd v Commissioner of State Revenue (Vic) (1996) 186 CLR 630. For a case of invalidation of a federal law on the basis of an implication protecting the States see Austin v The Commonwealth (2003) 215 CLR 185 (taxes on State judges' superannuation). MD Kirby, Through the World's Eye (Federation Press, Sydney 2000), xvi. Ibid at xvi citing also AF Mason (1997) "Foreword" in Rishworth, above n 4, ix and P Downey, "Simplicity, Fairness and Reasonable Expectations"  NZLJ 147. Coal Acquisition Act 1981 (NSW), s 5. (2001) 205 CLR 399 at 401. Gaudron, McHugh, Gummow and Hayne JJ; Callinan J in short reasons generally agreed. (2001) 205 CLR 399 at 409 citing Union Steamship Company of Australia Pty Ltd v King (1988) 166 CLR 1 at 10. (2001) 205 CLR 399 at 410. (2001) 205 CLR 399 at 428. (2001) 205 CLR 399 at 431  citing Kable, above n 45. (2001) 205 CLR 399 at 430 -. (2001) 205 CLR 399 at 432 . (2001) 205 CLR 399 at 431 . Minister for Immigration, Multicultural and Indigenous Affairs v B (2004) 75 ALJR 737. (2004) 75 ALJR 737 at 763 . (2004) 75 ALJR 737 at 768 . Australian Constitution, covering cl 5. Re Woolley; Ex parte Applicants M276/2003 by their next friend GS  HCA 49. Re Woolley  HCA 49 at . (2003) 78 ALJR 105 at 134 . (2003) 78 ALJR 105 at 135-137 -. (2003) 78 ALJR 105 at 137  applying Mabo (1992) 175 ALJR 1 at 42. (2003) 78 ALJR 105 at 144 . Re Paterson; Ex parte Taylor (2001) 207 CLR 391. The retirement of Gaudron J and her replacement by Heydon J.
 Singh v Minister for Immigration, Multicultural and Indigenous Affairs (2004) 78 ALJR 1383 referring to the Australian Citizenship Act 1948 (Cth), s 10(2)(b). Collins v The Queen (1975) 133 CLR 120. (2004) 78 ALJR 780 at 784 .
 cf Gibbons v Duffell (1932) 47 CLR 520 at 535 per Evatt J; Raymond v Honey  1 AC 1 at 14 per Lord Bridge of Harwich and M Finnane and T Woodyatt, "Not the King's Enemies": Prisoners and their Rights in Australian History" in D Brown and M Wilkie (eds), Prisoners as Citizens: Human Rights in Australian Prisons, (2002) 81 at 100. ICCPR, art 14.1. See Muir (2004) 78 ALJR 780 at 785 . (2004) 78 ALJR 1099 at 1128-1497 -. (2004) 78 ALJR 1056 at 1130 - citing R v Governor of Durham Prison; Ex parte Singh  1 WLR 704; Tan Te Lan v Superintendent Tai A Chan Detention Centre  97; Beit Sourik Village Council v Government of Israel, HCJ 20056/04 at . (2004) 78 ALJR 1056 at 1134-1135 - citing Atkins v Virginia 536 US 304 at 316 n 16 (2002); Lawrence v Texas 539 US 558 at 576-577 (2003). (2004) 78 ALJR 1056 at 1135 . Quoting Kennedy J (for the Court) in Lawrence 539 US 558 at 576 (2003). (2004) 78 ALJR 1056 at 1112-1115 -. (2004) 78 ALJR 1056 at 1115 . (2004) 78 ALJR 1056 at 1135  referring to the dissents of Scalia J in Atkins 536 US 304 at 347-348 (2002) and in Lawrence 539 US 558 at 586 (2003). See also Coleman v Power (2004) 78 ALJR 1166 at 1171 - per Gleeson CJ]; 1210-1212 - of my own reasons. cf Rasul v Bush 72 USLW 4596 (2004). Rumsfeld v Padilla 72 USLW 4584 (2004). (2004) 78 ALJR 1519 at 1542-1543. (2004) 78 ALJR 1519 at 1555-1556 -. J Grundberger, A Social History of the Third Reich (1971), 123. Applying Kable (1997) 189 CLR 51. (2005) 78 ALJR 1483 at 1495-1496 -; cf (2004) 78 ALJR 1519 at 1543 at . See KJ Keith, Sir David Williams Lecture, unpublished, 7 November 2003, 5. Parliamentary sovereignty has been criticised as not fitting the law of England: I Jennings, The Law and the Constitution (5th ed, 1959), 318.
 cf Gipp v The Queen (1998) 194 CLR 106 at 147 . S Sasson, Losing Control: Sovereignty in the Age of Globalisation (Columbia Uni, NY, 1997); Chayes and AH Chayes, The new sovereignty: Compliance with international regulatory agreements (Harvard, 1998); AFM Maniruzzaman, "Global economic governance and the challenge facing traditional international law in the 21st century" (2004) 54 Amicus Curiae 10, citing United Nations Secretary-General, Kofi Annan: "Simply put, our post-war institutions were built for an international world but we now live in a global world". Australian Communist Party v The Commonwealth (1951) 83 CLR 1 at 187-188 per Dixon J.
 Adelaide Company of Jehovah's Witnesses Inc v The Commonwealth (1943) 67 CLR 116 at 124 per Latham CJ. Australian Communist Party Case (1951) 83 CLR 1. Al-Kateb (2004) 78 ALJR 1056. B v Harris, "The Constitutional Future of New Zealand"  New Zealand Law Review 269. Such as has existed over the entire history of the Court. See eg D'Emden v Pedder (1904) 1 CLR 91; Victoria v The Commonwealth (1971) 122 CLR 353; R v Kirby; Ex parte Boilermakers' Society of Australia (1956) 94 CLR 254; Theophanous v Herald and Weekly Times Ltd (1994) 182 CLR 104; Kable v Director of Public Prosecutions (NSW) (1997) 189 CLR 51. FM Neasey and L Neasey, Andew Inglis Clark (2001), 228; A Nicholson, "An Australian Bill of Rights? ", Concannon Oration, Toowoomba, October 2004, unpublished. In 2004 the Australian Capital Territory adopted a statutory bill of rights which is now in operation: Human Rights Act 2004 (ACT); cf G Williams, The case for an Australian Bill of Rights (2004) 20, 42, 77. A survey in 1997 showed that 72 per cent of the respondents in Australia now favoured some form of bill of rights: Williams, 64. See "Crisis. What Crisis?" NZLJ 309; S Franks  NZLJ 11; "The Supreme Court"  NZLJ 380. R Inglehart and P Norris, "The True Clash of Civilisations", Foreign Policy, (March/April 2003), 63.